Big, strong and stunning body is the simple features of our popcorn machine, which are adequate for alluring you to own it. 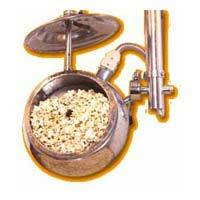 Our popcorn machine comes with a dual heater and a stainless steel kettle for a longer run. 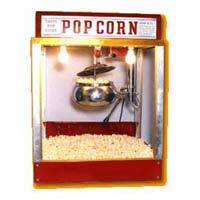 We provide popcorn machines at affordable prices, which would surely take care of your budget. Shopping malls, cinemas, dept. stores, fast food parlors, college & office canteens, school areas, crowded streets, wherever People move in large numbers, POPCORN always sells like Hot Cakes - One bag of popcorn has only 55 calories - its filling & plus corn is rich in protein. The scent of freshly popped corn is enough to pull in the large nos. - and you can quickly recover your low initial investment with each bag sold. Also no special inputs required other than readily available corn, salt, oil & spice. It's Profit All The Way!! Also there can be varieties in popcorn Cheese, Caramel, Salted a different type for every taste & choice. BEAUTIFUL RED BORDER Metallic Body. 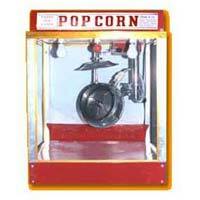 Pop Corn machine is a display unit in public places Attractive colour & size pulls in the crowd. Heavy Duty Rotary Motor & Stainless Steel Kettle for continuous use & long life. Dual Heater & Round Rotary Movement, separate switches. Big, sturdy & beautiful body - and easy to clean pull out tray feature for disposing unpopped seeds.